SINGAPORE: In the face of mounting complaints about traffic snarl-ups at the Woodlands and Tuas Checkpoints, Singapore Law and Home Affairs Minister K Shanmugam has acknowledged that the immigration authorities face a manpower crunch. But he pointed out that the labour shortage was not unique to the Immigration and Checkpoints Authority (ICA), and that many other sectors across Singapore face the same issue. “It’s not for want of trying, we just don’t have enough manpower in Singapore and only Singapore citizens can take up this job,” Shanmugam told reporters after a visit to the Woodlands Checkpoint. In response to the surge in travellers entering and leaving Singapore over the festive period, more than 500 ICA officers at the Woodlands and Tuas Checkpoints clocked overtime last week, the minister noted. “They are working their guts out,” added Shanmugam, who said only up to 10 per cent of its workforce have been allowed to go on leave during the holiday season. Officers are deployed based on where the demand is highest. This means that the ICA could cut back on manpower in the arrival area so that officers may be dispatched to the departure hall, or vice versa. As a consequence, some counters may be closed as officers are redeployed. The old Woodlands Checkpoint was also reopened in 2008 to cater for extra demand, said Shanmugam. “But you might see counters closed there because it might be catered exclusively, say, at certain times, for lorries,” he added. 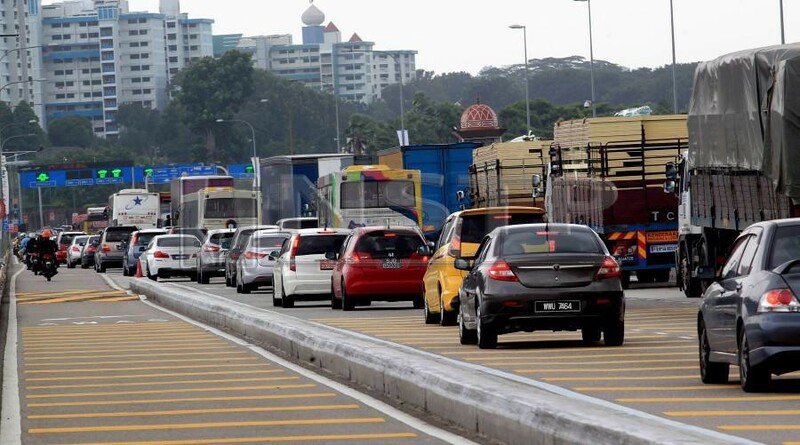 Shanmugam’s comments came after motorists bemoaned traffic tailbacks affecting roads into and out of Malaysia in the past fortnight, with some claiming that the jams had stretched up to eight hours. Many raised questions on whether the Singapore checkpoints were adequately staffed, pointing out that only a number of counters were open when they passed through. They urged the ICA to beef up manpower during this peak travel period. Others were more understanding, conceding that the gridlocks along the Causeway have been a part of life for years, particularly during the year-end holidays. About 400,000 travellers use Singapore’s land checkpoints daily, with the number rising to around 430,000 during the year-end school holidays and festive season. Shanmugam said the traffic situation is similar yearly, though demand is on the rise. Asked what else the authorities plan to do to resolve the long-running gridlocks, Shanmugam said that there is a limit on the number of counters, as well as vehicles that can be cleared at any given time at the Woodlands Checkpoint. The ICA has been tapping technology, which has helped ease the clearance process even as demand has surged. Still, he said the authorities are mulling over longer-term measures to overcome “the physical footprint” of the Woodlands Checkpoint and details will be announced “when we can”. Technology is a key enabler, said Shanmugam, though he declined to give details when asked to elaborate on the measures being considered and when motorists can expect them to be in place. The minister stressed that ICA officers have to be on alert during the year-end, a period when security risks increase. “We do our best, but security is paramount so we clear (travellers) as quickly as we can, with the force that we have,” he said. Heavy traffic through the Woodlands and Tuas Checkpoints is expected to continue until the end of the year. The ICA said that it monitors arrival and departure traffic conditions in real time across various modes, such as cars and buses, to ease clearance at the checkpoints during peak periods. To facilitate the process, the authority also adopts measures such as the flexible use of lanes for various modes of transport.